Overcoming common housebreaking problems can put an end to your dog's house accidents. Whether you plan to use puppy pads or train your dog outside to go, these tips will put an end to your dog pooping and peeing all over your home if you're consistent with the house training process. Training your dog not to go to the bathroom in the house can be very challenging, and it's often very frustrating for the people and canines involved. Housebreaking a pet takes time, patience and a commitment to teaching desired behaviors through positive reinforcement. It's important to realize it's inevitable that you'll experience some problems along the way. It's not realistic to expect that your pet will immediately catch on to what you are trying to teach or that accidents won't happen even after your dog begins to learn the desired behaviors. You'll find potty training your dog to be much less stressful if you are aware of what leads to common housebreaking problems that arise during the process. Simply being aware of what to expect can help you realize that things are progressing as they should even when it seems like you are getting nowhere. This will also help you take corrective action immediately. Some problems that dogs experience during housebreaking may actually be signs of health problems. If your pet seems to be straining during urination, for example, this could be a sign of kidney stones or a bladder infection. If the frequency of urination accidents seems to increase rather than decrease as you go through the training process, your pooch may need to be checked for diabetes. If frequent accidents start happening after your dog has been housebroken, canine urinary incontinence could be the cause of the problem. If you observe anything that could be a health problem rather than a training problem, immediately take your dog to the veterinarian for a checkup. Pet owners often make the mistake of blaming their pets for housebreaking problems. Frustrated owners who feel that they have made their best efforts at teaching their pets what to do may decide that the animals are too lazy, stubborn or stupid to learn the desired behavior. They may throw up their hands in frustration and claim that their dogs simply "want" to ruin the carpet or make the house smell bad. While expressing frustration in this manner may be understandable, it is not accurate. As long as there's not an underlying health problem causing the housebreaking challenges, your dog can learn appropriate bathroom behavior. Your pet doesn't have any "wants" associated with going to the bathroom. There's nothing to be gained from blaming your pet for housebreaking problems. Instead, focus your energy on looking at what you can change in the training process to ensure that the desired behaviors are being properly reinforced. Most housebreaking problems are associated with how the owner handles the training process. For training to work, you must use appropriate dog training techniques on a consistent basis over a period of time. 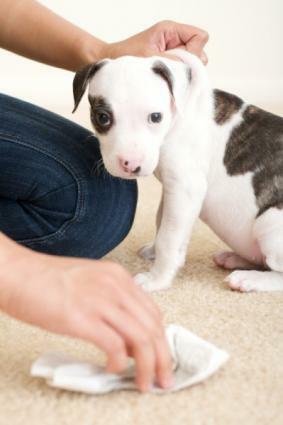 Proper housebreaking training involves helping your dog develop a habitual schedule for relieving him or herself. For example, you need to begin by choosing a location where you want to teach your dog to go to the bathroom. Next, you need to take your dog to that same spot several times each day following a consistent schedule that makes sense in light of the times of day that your dog eats and drinks. When your dog goes to the bathroom in the correct spot, reward the behavior with praise. You may also want to choose a training phrase or word to associate with appropriate bathroom behavior. Problems develop when dog owners incorporate punishment for mistakes and accidents into the process. There is nothing to be gained from punishing a dog for making a mistake and doing so can actually result in setbacks in the training process. Other common training problems include a lack of consistency in terms of timing and/or location, failure to praise desired behaviors, and stopping the formal training process too soon. With the exception of health-related problems, the issues that can have a negative impact on housebreaking success are owner (or trainer) problems rather than problems with the dog. As a pet owner, it's up to you to recognize the importance of your role in the training process and to commit to using appropriate techniques to help your dog learn what to do. When you do, you'll be able to make forward progress in your efforts to successfully housebreak your beloved pooch.